Rise of the Planet of the Apes hits theaters this Friday with a moving tale of genetically-altered apes who achieve human-level intelligence. But how does this film fit into the complicated time-travel tangles of the 40-year-old franchise? Let's investigate. Illustration for io9 by the fantastic Stephanie Fox! The Planet of the Apes franchise started with La Planète des singes, a somewhat satirical French novel by Pierre Boulle published in 1963, about a human astronaut landing on a planet full of intelligent apes and devolved humans. But the story really took off in 1968 with the release of American scifi action flick Planet of the Apes, starring Charlton Heston as an astronaut who overstays his time in hypersleep by a couple of millennia. When he crash-lands on a planet, he thinks he's found an alien world ruled by apes, but eventually realizes he's in Earth's distant future, where apes rule the planet. He's befriended by the scientist chimps Zira and Cornelius, who dub Heston "bright eyes" and keep him as a lab animal. We know he took off from Earth in 1972, and has landed in 3978, because of some helpful chronometer readouts in his ship, the Icarus. In Tim Burton's reboot of Planet of the Apes, Heston replacement Mark Wahlberg takes off in a ship in 2029, and lands on another planet, ruled by apes, in 5021. Why make it so much further in the future? Did that really seem more realistic? Who the hell knows. At the end, Wahlberg returns to contemporary Earth and finds that it is run by apes too. This is similar to the original French novel, except that the astronaut in that book returned to Earth 700 years in the future. So actually it's not like the French novel at all, and it makes no sense. Please do not see this movie. In the popular but critically-panned sequel, Beneath the Planet of the Apes, a rescue party comes to find Heston's ship. They discover a tiny group of super-mutated, psychic humans living underground, worshiping a nuclear warhead. There's a huge battle between the apes and the underground humans, which results in the warhead going off and destroying the planet for good. I am assuming that this movie takes place right after the first one, since we see Heston fleeing the apes at the beginning, just as he was at the end of the 1968 film. But it's possible that a few years have elapsed. Also, bizarrely, the preview for the movie pegs it as 3955. I give up. Luckily for Zira and Cornelius, there is a way out of nuclear apocalypse: Use the Icarus to travel back in time to 1973! And that's just what they do in Escape from the Planet of the Apes. Zira and Cornelius, the time-traveling, talking apes, become celebrities. Until Zira gets drunk and lets slip that she used to have human lab animals and dissected them. Then the humans lock the chimps up, and torture them for information about the future. Ape sympathizers help them escape, but not before Zira's newborn baby Milo (later renamed Caesar) is hidden safely with an animal trainer. This is when I would argue that we get two branching timelines in the Apes franchise. I'm sure there are other interpretations, especially since I'm basically trying to impose sense on a franchise whose time travel story nobody bothered to keep in continuity. So here goes. In one timeline, we follow Caesar's life 20 years after the death of his parents. In the intervening years, a virus has wiped out most dogs and cats on Earth, so humans have taken to keeping apes as pets. No, there is no good reason why they do this instead of keeping rats or foxes or whatever. Quickly the humans realize that apes make better slaves than pets, and the world is quickly divided into a slave ape class, trained to be as human as possible, and a ruling human class. Caesar is the companion of Ricardo Montalban (yay! ), an ape sympathizer. Caesar eventually leads an ape rebellion against the humans. Originally, the film ended with a scene (see at left) where the apes slaughter humans violently and Caesar looks on with an expression of grim acceptance. This would have been the perfect entree to the world of Apes that Heston later encounters, where humans are reviled. But test audiences hated it, so the ending was softened so that Caesar's girlfriend screams "no!" when the beating begins, and Caesar follows it with a moving speech about having mercy on humans and living in harmony. In Rise of the Planet of the Apes, coming out this Friday, the timeline is definitely going to be different. I hesitate to call this movie a reboot, because this film is really a complete re-imagining of Conquest of the Planet of the Apes. We do hear about the Mars-bound spaceship Icarus disappearing, presumably starting the time-travel timeline. But the apes' rise is going to be very different from the one in Conquest, because Caesar and his troop have been uplifted by a gene therapy virus — which changes the playing field with humans in ways you'll just have to discover for yourself by seeing the movie! The Caesar of this film is, if anything, much more merciful than the Caesar of Conquest — he tries to prevent the apes from killing humans, and seems to want only freedom, not conquest. This film takes place 10 years after the events of Conquest, though it also has a frame story set 600 years in the future, where a wise ape is telling the story of events we're about to witness in "the present." This future is clearly different from the one Heston will encounter in the original Planet, because humans and apes are living in harmony. We witness the rise of ape civilization in this movie, but Caesar cautions the apes not to enslave and brutalize humans. It seems that we're witnessing an alternate future from the one where Caesar's parents came from, where apes were unequivocally masters of the world and humans are animals without language or culture. OK, now for the other timeline spawned by the events in Conquest. 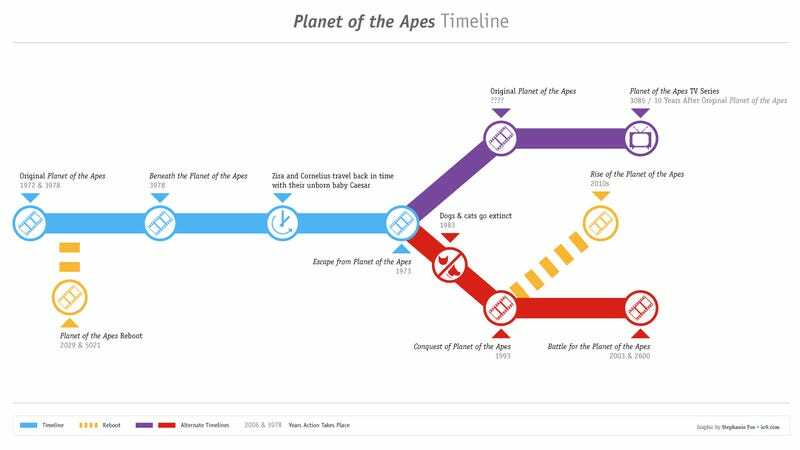 This would be the timeline that leads to the original Apes movie, where Heston crash-lands on future Earth. The confusing part comes when you try to reconcile the events of the short-lived Apes TV series with the original Apes movie. This series is set in 3085, with astronauts crash-landing on future Earth just the way Heston and Co. did in the first movie. The date would set the events of this series about 900 years before Heston's crash, but apes in the show tell our human characters that a ship similar to theirs landed "ten years ago." Clearly this is supposed to be the ship from the first movie. So let's give the writers the benefit of the doubt, and assume they thought about this as hard as we are right now. Maybe they set it 900 years earlier because Caesar's parents going back in time has changed the timeline and caused Apes to happen almost a millennium earlier? I know that makes no sense at all, but it's the best I've got.